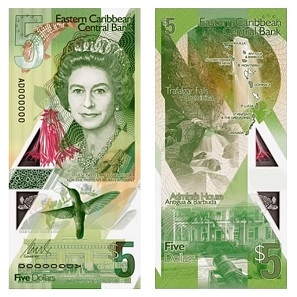 October 25, 2018 – The Eastern Caribbean Central Bank (ECCB) have announced that a new family of banknotes with new designs and security features will be issued from next year with the two largest denominations – that of the $50 (US$ 18.50) and $100 (US$ 37.00) notes beginning the changeover. The greatest change to the ECCB currency notes will be that they will be printed on polymer transitioning from a cotton paper fibre. The decision to change to a polymer substrate is to increase the durability of the banknotes in circulation throughout the Eastern Caribbean, which have previously been printed on traditional cotton substrate. With a longer note life as a frequently used denomination printed on polymer will often remain intact for an average of four years, the Bank hopes to experience long-term cost savings on banknote production. It is the first time the ECCB has issued a new banknote series since 1993, though the previous series has had several upgrades since its launch. Another significant change to ECCB banknotes will be that as in many other countries who have recently issued a new family or series, the new banknotes will be designed using a vertical format rather than horizontally as their previous designs. The colour scheme of each of the five denominations which range from $5 to $100 will continue to be the same as the current series to aid public recognition and acceptance of the new banknote family. The new $5 and $10 banknotes issued by the ECCB. Image: Eastern Caribbean Central Bank. All of the current denominations will make the change-over and with the use of polymer, new security features will be included in the new designs. The highest three denominations of the $20, $50 and $100 notes will have a holographic see-through window integrated into the overall design. As an added security feature, the holographic window appears black due to specialised technology incorporated into the clear window if the notes are scanned. The $5 and $10 denominations will have a similar holographic window integrated into their design but on a smaller scale. The banknotes will continue to have the same dimensions or size, which are all uniform in size regardless of denomination. The obverse or front side will also continue to include a portrait of HM Queen Elizabeth II. The new $50 and $100 banknotes issued by the ECCB. Image: Eastern Caribbean Central Bank. 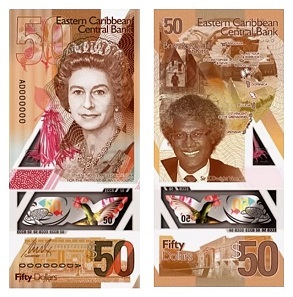 The reverse side of the new $50 note will include an image of the late Honourable Sir K Dwight Venner (1946-2016) Governor of the Eastern Caribbean Central Bank from December 1989 to November 2015. 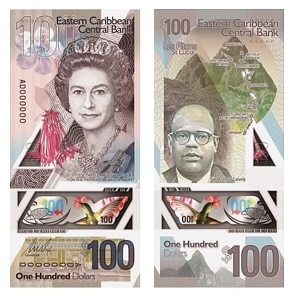 The reverse side of the $100 banknote will include an image of Sir Arthur Lewis, (1915-1991) the Saint Lucian economist well known for his contributions in the field of economic development. 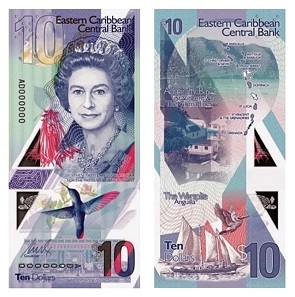 Other designs on the reverse sides of the 5, 10 and 20 Dollar notes integrates landmarks and landscapes from locations within the seven permanent members of the Organisation of Eastern Caribbean States including Admirals House ($5) in Antigua & Barbuda – Admiralty Bay ($10) in St. Vincent & the Grenadines and Government House ($20) in Montserrat. The Eastern Caribbean Central Bank with their headquarters in Basseterre, St. Kitts was founded in October 1983 as the successor to the British Caribbean Currency Board, issuer of the former British West Indies dollar from 1965. Their primary goal was of maintaining the stability and integrity of the sub-region’s currency and banking system in order to facilitate the balanced growth and development of its member states who are the seven full members and one associate member of the Organisation of Eastern Caribbean States (OECS). The East Caribbean Dollar is subdivided into 100 cents and is normally abbreviated with the standard dollar sign $ and usually indicated as EC$ to distinguish it from other dollar denominated currencies. The EC$ has been pegged to the United States dollar at an official rate of US$ 0.37 or EC$ 2.70 since the 7th July 1976. More recent changes to the currency system in the OECS was the elimination of the one and two cent coin denominations from circulation in July 2015, citing the increased expense for their production. For additional information about the coins and currency of the East Caribbean Central Bank, please visit their website. ECCB has also produced a video for children explaining the history of the EC Dollar. This short news clip offers additional information on the notes as well.